Since posting the Del.icio.us Inside and Tagging behind-the-firewall posts, I've been pinged left right and center by a bunch of tagtastic people (both inside and outside Microsoft) regarding the topic of tagging within the enterprise / business context. I wanted to highlight for you two things I've seen recently that show where I think we're going with all this. The first is a post by Waseem Sadiq, who works at Macaw in Holland. Waseem pinged me earlier today to let me know of a cool tagging behind-the-firewall case study he has written up over at his blog with an accompanying screencast. "we actually have two different sets of applications. One that mimics the behaviour of del.icio.us and acts like a social bookmarking site (working on the same set of data), you can see a few screenshots of this application showing and posting bookmarks." "Another application that we have built is what we call “Visor”, and is a much richer and dynamic application built on top of (what a coincidence) Microsoft’s WPF platform. This is the application I demo in the screencast"
In my view, del.icio.us-type application as a business server product is a total no-brainer in terms of its potential. I want one. The other app looks interesting, but until I play with it, I can't really give an opinion. The screencast helps, but I'm not really 'getting it'. The other interesting find is Taglocity, an add-in application to Microsoft Outlook that provides a tagstatic interface into emails, calendar items, contacts and tasks. "People send and receive a lot of email, and a significant part of people's time is in trying to manage their inbox, or find important information. Using tags, through a simple user interface you already know, is more productive than many confusing inbox folders, complex rules or new applications to learn." It's a powerful application and well worth a play. Taglocity is entering Beta 2, but I'm very impressed with Beta 1 - the application is already very feature-rich today. Check out a screencast that walks through the various scenarios. It has huge potential. I'm getting very interested in this space - tagging inside and across businesses is going to get very big very quickly - and there is plenty of room for experimentation in this area. If there is anything you think I'd like to see in this context that you've developed or is in progress, just ping. Update - just after I posted this, I caught Steve Eisner's post 'Cleaning up the tag-soup' - a nice read. I will try to explain a bit more about why exactly we chose to build "Visor" next to our regular-delicious-like tagging environment in a post shortly. If anyone is interesting in joining the beta program to try Taglocity then please let us know, we are ramping up to let more people into Beta 2 and would really appreciate your interest. Thanks. Love what Waseem is doing. 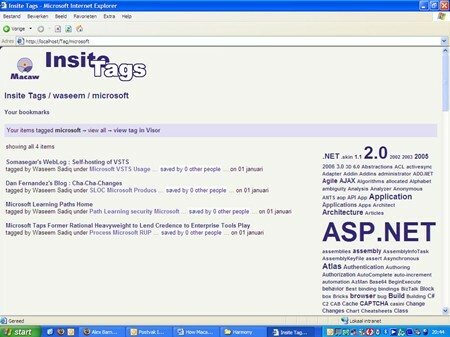 We’re also developing a MS-based enterprise tagging application which is due to be released as private beta in the next month. Thanks for the link, Alex! You were one of the people I wanted to follow up with after Seattle MindCamp, so I hope we get a chance to continue the conversation sometime soon… Meanwhile, I definitely value your feedback on any of my blog posts! As it happens, it was the "delicious inside" session that got me started blogging. We never got a chance to really tackle the excellent list of kickoff questions provided by you, Geoff and Michael. So I thought I’d at least take a crack at my answers, providing some examples from our product as context, and see if it might stir up some more discussion. In any case, it’s been really productive for me – while researching for my articles I’ve found a lot of excellent work being done in this space, by folks like Waseem, David and Niall. I hope our criss-crossing threads will help to build a rising awareness that "floats all boats", as they say. If you are interested in tagging, checkout http://www.rawsugar.com. 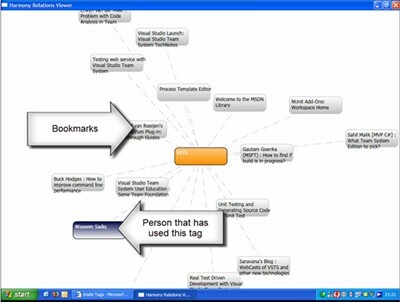 They use hierarchical tags to help refine search for user’s bookmarks and blogs. They also have a cool feature that allows the users to synchronize their blog posts to RawSugar, and they provide code you can copy paste to your blog template to create a searchbox and tagbox. Searching your blog posts becomes fast and easy.